Potential establishment of quagga mussels (Dreissena rostriformis bugensis) in novel aquatic systems is dependent on their survival, growth, and reproductive success in that system. Laboratory experiments are currently being conducted to evaluate the potential establishment of mussels in Lake Tahoe, California-Nevada by exposing individual mussels to ambient Tahoe water under controlled conditions. Additionally, given the importance of calcium for shell structure, treatments with calcium amendments to Tahoe water are also being evaluated in the experiment. The results of the experiment are expected to aid current approaches to managing invasive species in the Tahoe basin. Quagga and zebra mussels are establishing in western waterways with large densities in the Colorado Aqueduct system and established populations in North Central California. This invasion is already having profound ecological and economic impacts in these ecosystems. There is a debate amongst scientists and managers on whether the current models that predict the distribution of Dreissenid mussels are accurate. Recently for example veligers have been detected in Colorado lakes some of which have low calcium levels. Furthermore, a study in Lake George (NY) suggests that adult mussels are able to grow under low calcium conditions however the veliger recruitment determined from settlement bioassays is likely limiting. Thus, what will determine a source versus sink population may not be entirely clear and deserves some attention for Western waters. Survival from the veliger stage to adult stage is key in the establishment of dreissenid mussels in any water body: this indicates the ability for species establishment after introduction. Current knowledge suggests that Lake Tahoe can support adult mussels for s short period of time however, whether juveniles, and thus a reproducing population can sustain is currently unknown. The proposed research will directly assess the habitat suitability of Lake Tahoe and its watershed to support the establishment of quagga mussel by testing the survivability of veliger to sub-adult stage using Lake Tahoe water. This information will be important for supporting the current efforts related to inspection and washing of boats entering Lake Tahoe. 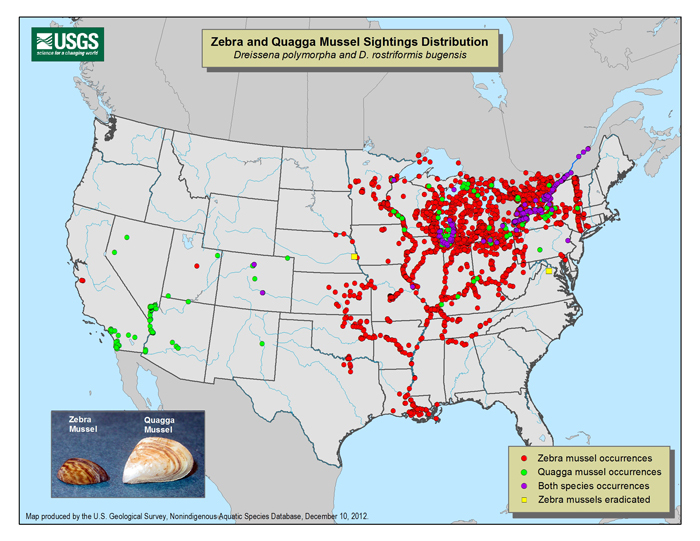 Find out more about the Quagga Mussel at the USGS site.